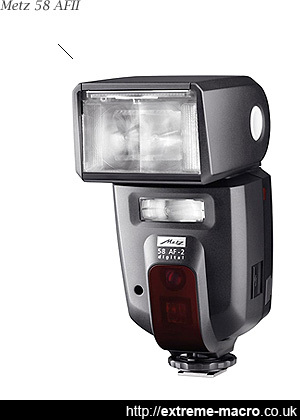 The Metz 58 AF-2 flash for Pentax mount is one of Metz' top flash units, has a guide number of 54, takes four AA size batteries and is compatible with all Pentax digital SLR cameras. The 58 AF-2 has PTTL auto, PTTL front sync, PTTL rear sync, TTL auto, auto flash and manual modes and is slightly larger than the 540 . At the time of writing the Pentax AF360FGZ flash retails for about �400. The Metz 58 AF-2 flash is loaded with features that makes it idea for extreme macro photography, be it used in the studio, mounted on a bracket or used top down with a diffuser. A flash that remembers its settings when it is turned off is a joy to use and the Metz 58 AF-2 flash does exactly this. The Metz 58 AF-2 tilts and swivels, and is the only Pentax compatible flash that can combine rear sync with manual use on the K7. But not by default on the K5 because Pentax, in their infinite wisdom, decided to remove this feature for no reason whatsoever. But you can fool the Pentax camera (see below). The Metz 58 AF-2 flash is loaded with features that makes it better for extreme macro photography than the non-ringflash Pentax units, be it used in the studio, mounted on a bracket or used top down with a diffuser. A flash that remembers its settings when it is turned off is a joy to use and the Metz 58 AF-2 flash does exactly this. The Metz 58 AF-2 tilts and swivels, and has a secondary small flashbulb that can also be adjusted which is rather nice for a little extra illumination if you use it horizontally like I do in the field. The Metz 58 flash has a huge swathe of manual power settings down to 1/256, and has 1/3 stops in between. The Metz 58 flash is the only Pentax compatible flash that can combine rear sync with manual use, something that neither the Pentax AF360FGZ nor even the top of the range Pentax AF540FGZ can do. Recycling time is fast and whilst the next shot can be taken after 2s with an added power pack, there is a 4 sec recycle to full using just the 4 NiMH or alkaline batteries. Colour temperature and exposure show good consistency even down to the lower levels. The 58 AF-2 flash has a metal foot and a tightening ring to keep it seated in the cold or hot shoe. Whilst a little bit bigger and heavier than the Pentax 540, it looks a little bit more basic but, time telling, maybe this translates into longer use. In terms of extreme macro ruggedness it ticks all the boxes that need to be ticked. The Metz menu system comes in for a lot of flak online, but once you work it out it is perfectly sensible. It is more menu driven than the Pentax flashes though so there's a bit more clicking. The only other thing that I prefer about the Pentax flashes is the light button on the interface. Metz doesn't have this, and I wish it did. Another interesting thing that the Metz has is a strobe mode, which can be adjusted for frequency. This may prove interesting for macro in the future, as it gives unusual photo possibilities like a bee flying towards a flower caught in strobe mode. The Metz 58 flash is the only Pentax compatible flash that can combine rear sync with manual flash use but it now only seems to be able to do this on the Pentax K-7. With extreme macro lenses being 'manual' (ie non -a series and up), the rear sync pop mistimes on the Pentax K-5, coming after the curtain is already down. Metz put this down to a Pentax K-5 problem, and Pentax have confirmed to me personally that it does not work on the Pentax K-5 on manual exposure with manual extreme macro lenses. In fact according to Pentax it shouldn't work on the Pentax K-7 either, but actually it does. The key here is manual lenses - manual flash with rear sync works just fine with some ranges of Pentax lenses (-a series and up) but not 'manual' ones (ie reversed lenses or non aperture linked lenses like JMLs, objectives, microfilm lenses etc) that we tend to use in extreme macro. With this new feature Pentax has managed to make its entire system hopeless for extreme macro using manual non-aperture communicating lenses like most of us do. Having initially purchased a Pentax AF360FGZ only to find out that this has a timeout that can't be switched off, then bought a Pentax AF540FGZ only to find out that this can't do rear sync with manual, I eventually purchased this top of the range Metz 58 AF-2 only to now find out that Pentax go and disable the functionality on the latest Pentax K-5, Pentax K-5II and K-5IIs DSLRs. Stellar. If you want to use rear sync on manual from this Metz unit, it is possible to fool your Pentax camera (works on K5). The reason it doesn't work is because of the manual lens that you have connected via a "contactless" tube or bellows. So, you have to fool the camera into thinking that it actually has a full contact lens attached. So I used an empty lens (a deglassed -a 50) as an extension tube, with the bellows and extreme macro optic in front of that, and this successfully fooled my camera into thinking it had a full aperture communicating lens attached. It is a sad footnote to report that Metz filed for insolvency on November 19, 2014. This may affect your purchase of the product, although the company intends to honour production and support. According to the company "during the preliminary insolvency process all business operations will be entirely continued. All products and services will be provided as usual. The aim of the insolvency process is to restructure and restart the company". On the Pentax K-7 the Metz 58 AF-2 flashgun shines, and is the flashgun of choice used in all my extreme macro work. The Metz 58 AF-2 was at the time Metz' top flashgun model and isn't the cheapest, but the Metz 58 AF-2 flashgun has proven its worth a dozen times over. Do it horizontally for fast recharges and long-lasting batteries!